The foundation repair specialists at Ayers Basement Systems are especially well-equipped to make these types of pool deck repairs. Contact Ayers Basement Systems to have your pool deck inspected today! 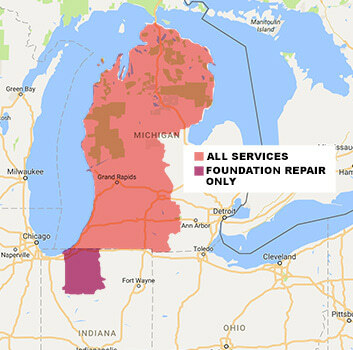 We serve Lansing, Grand Rapids, Kalamazoo and neighboring areas throughout Michigan & Indiana. Get a free estimate for pool deck lifting and repair. Call the experts at Ayers Basement Systems today to schedule a free pool deck inspection and repair estimate. Sunken, settled concrete sidewalks, patios, driveways, and slabs can also be repaired with PolyLevel®. We're Mid, Western and Northern Michigan's experts for concrete leveling, proudly serving Grand Rapids, Lansing, Kalamazoo, Muskegon, Battle Creek, Mount Pleasant, Jackson, Niles, Alpena, Traverse City and nearby. Give us a call at 1-844-262-2971 or contact us online for a pool deck leveling and repair quote!